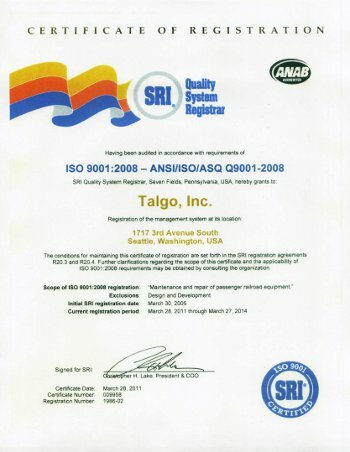 Talgo, Inc. has established, implemented, maintains, and continually improves the effectiveness of its Quality Management System (QMS) in accordance with the requirements of ISO 9001. Talgo identifies all Quality Management System processes and determined how these are applied throughout the organization. Included within these processes are those needed to manage suppliers that have the potential to affect product or service quality. These processes are analyzed to determine their interaction with other processes and what approach is required to ensure that both the operation and control of these processes is effective. Sufficient information and resources necessary to ensure that these processes are operated, monitored, measured and analyzed are provided. Actions are taken to ensure that these processes are continually improved in an effort to achieve the planned results. Talgo is committed to the development and implementation of the Quality Management System, and demonstrates this commitment through its focus on maintaining the Quality Management System effectiveness. Talgo has established the Quality Policy and objectives, and conducts regular Management Review meetings to evaluate the ongoing effectiveness of the Quality System. Talgo further demonstrates its commitment by continually emphasizing the importance of fulfilling the customer’s, as well as statutory and regulatory, requirements. Talgo ensures that the customer requirements are clearly defined and documented to enable Talgo to direct its efforts toward enhancing customer satisfaction. Talgo updates the company business plan annually. During the update of existing plans, consideration is given to the development and/or improvement of the quality system. At each annual update to the plan, previous quality objectives are reviewed and new ones are established. Careful consideration is given to ensuring the integrity of the current quality system while improvement efforts are planned and implemented. Measurable quality objectives are established and documented at all relevant functions and levels of Talgo. The objectives are used to improve the company’s performance and provide an effective means of facilitating performance evaluation. The quality objectives are reviewed annually and adjusted as needed for continual improvement.